Mechanisms of C9ORF72-mediated neurodegeneration in ALS/FTD. A hexanucleotide repeat expansion in the C9ORF72 gene has recently identified as the most common known genetic cause of familial and sporadic amyotrophic lateral sclerosis (ALS) and frontotemporal dementia (FTD). Recent evidence employing iPS-neurons from C9ORF72 ALS patients suggests that the GGGGCC RNA products transcribed from the repeat expansion form complex G-quartet RNA structures and are neurotoxic. Similar to other repeat expansion disorders (e.g., myotonic dystrophy type I and II), the C9ORF72 GGGGCCexp RNA can sequester nuclear factors, including RNA binding proteins, and these aberrant interactions we hypothesize are the primary cause of C9ORF72 neurotoxicity. 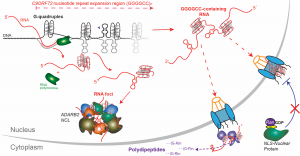 Previous work from our lab has indicated that the GGGGCC RNA interacts with members of the nuclear pore complex including RanGAP1, a regulator of Ran-mediated cyto-nuclear trafficking. We have also found that genetic modulation of the classical nuclear import pathway robustly suppresses the neurotoxicity in a Drosophila model system that overexpresses GGGGCCx30 RNA. Consistent with a this, we have found that the G4C2 Drosophila model and iPS neurons from C9ORF72 ALS patients show reduced nuclear localization of NLS-containing reporters and also exhibit perturbed Ran protein gradients. Importantly, these nuclear transport deficits can be rescued by treating the Drosophila and C9ORF72-patient derived iPS-neurons with antisense oligonucleotides that target GGGGCC repeat-containing RNAs or small molecules that bind G-quartet RNA structures to prevent any interaction with endogenous proteins. Taken together, these studies strongly support a sense strand gain-of-function mechanism underlying C9ORF72 neurodegeneration. 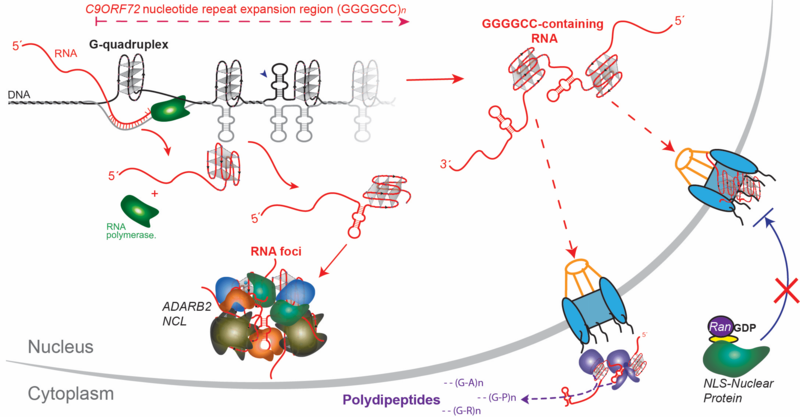 Moreover, we show, for the first time, that the toxic GGGGCCexp RNA impairs the nuclear import of classical NLS-containing proteins via an aberrant interaction with RanGAP1. From these studies, we hypothesize that nuclear trafficking may in fact be a common pathophysiological event that underlies many dementias and motor neuron disease more widely. S. Li, J.J. Overman, D. Katsman, C.J. Donnelly, J.L. Twiss, G. Coppola, D.H. Geschwind, S.T. Carmichael (2010) An age-related sprouting transcritome provides molecular control of axonal sprouting after stroke. Nature Neuroscience 13(12): 1496-1504. C.J. Donnelly, M. Fanzilber, J.L. Twiss (2010) Subcellular communication through RNA transport and localized protein synthesis. Traffic 11(12): 1498-1505. D.E. Willis*, M. Xu*, C.J. Donnelly*, C. Tep, M. Kendall, M. Erenstheyn, A. English, N.C. Schanen, C.B. Kirn-Safran, S.O. Yoon, G.J. Bassell, J.L. Twiss (2011) Axonal Localization of transgene mRNA in mature PNS and CNS neurons. The Journal of Neuroscience 31(41): 14481-14487. *These authors share equal contribution. C.J. Donnelly*, D.E. Willis*, M. Xu*, C. Tep, M. Kendall, M. Erenstheyn, A. English, N.C. Schanen, C. Kirn-Safran, S.O. Yoon, G. Bassell, J.L. Twiss (2011) Limited availability of ZBP1 restricts axonal mRNA localization and nerve regeneration capacity. EMBO 30 (22): 4665-4677. D. Vuppalanchi, T.T. Merianda, C.J. Donnelly, G. Williams, S. Yoo, R.R. Ratan, D.E. Willis, J.L. Twiss (2012) Lysophosphatidic acid differentially regulates axonal mRNA translation through 5’UTR elements. Molecular and Cellular Neuroscience 50 (2): 136-146. M. Spillane, M. Ketschek, C.J. Donnelly, J.L. Twiss, G. Gallo (2012) Nerve growth factor-induced formation of axonal filopodia and collateral branches involves the intra-axonal synthesis of regulators of the actin nucleating Arp 2/3 complex. The Journal of Neuroscience 33 (8): 3311-3322. C.J. Donnelly, M. Park, M. Spillane, S. Yoo, A. Pacheco, C. Gomes, D. Vuppalanchi, M. McDonald, H.K. Kim, T.Merianda, G. Gallo, J.L. Twiss (2013) Axonally synthesized b-actin and GAP-43 proteins support distinct modes of axonal growth. Journal of Neuroscience 33 (8): 3311-3322. S. Yoo, H.H. Kim, P. Kim, C.J. Donnelly, D. Vuppalanchi, P. Kim, S.J. Lee, T.T. Merianda, D.E. Willis, N.I. Perrone-Bizzozero, J.L. Twiss (2013) Axonally localizing GAP-43 mRNA targeted by the HuD-binding site containing 3’UTR induces axon length elongation during nerve regeneration. Journal of Neurochemistry 126 (6): 792-804. C.J. Donnelly, P.W. Zhang, J.T. Pham, A.R. Haeusler, N.A. Mistry, S. Vidensky, E.L. Daley, E.M. Poth, B.N. Hoover, D.M. Fines, N. Maragakis, P.J. Tienari, L. Petrucelli, B.J. Traynor, J. Wang, F. Rigo, C.F Bennett, S. Blackshaw, R. Sattler, J.D. Rothstein (2013) RNA toxicity from the ALS/FTD C9ORF72 expansion is mitigated by antisense intervention. Neuron 80 (2): 415-428. A.M. Haidet-Phillips, L. Roybon, Li Y, C.J. Donnelly, C.E. Henderson, N.J. Maragakis. (2013). Gene profiling of human iPSC-derived astrocyte progenitors following spinal cord engraftment. Stem Cell Translational Medicine. A.R. Haeusler, C.J. Donnelly, G. Periz, R. Sattler, E. A. Simko, P.G. Shaw, M. S. Kim, A. Pandry, J.D. Rothstein, J. Wang. (2013). Structural polymorphisms of C9ORF72 hexanucleotide repeats cause ALS/FTD defects through abortive transcription and nucleolar stress. Nature 507 (7491): 195 – 200.